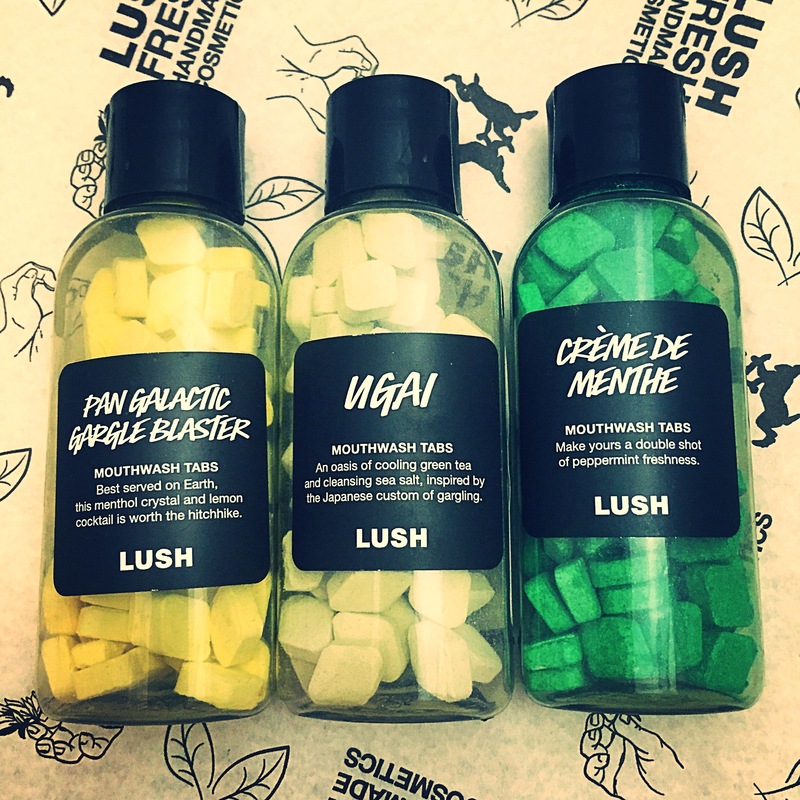 I love how creative lush are with their products, I was therefor beyond excited when lush first announced they would be introducing a range of solid mouthwash tabs. 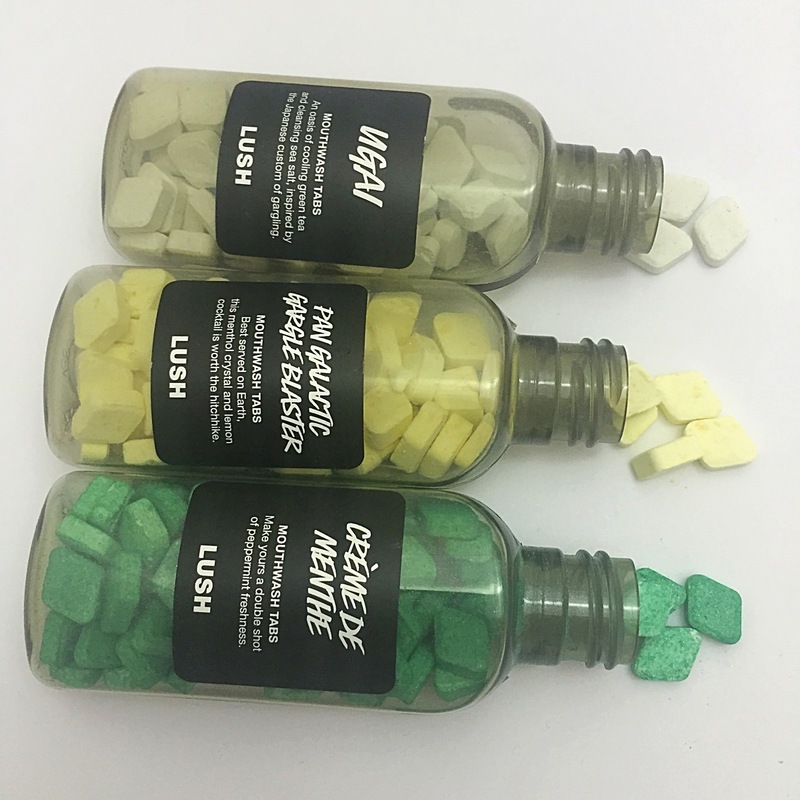 Not only are all of the lush products extremely creative they are also highly practical and I just couldn’t wait to get my hands on this new inventive product to find more about them. Mouthwash Is a regular product used by a lot of people as part of their daily routine. However I personally find that when I do a lot of traveling, packing and taking mouthwash with my is an absolute nightmare. With that in mind I was won over by the ingenious invention of a mouthwash in a solid form, as I new how much more easy it was going to be to take my mouthwash with me wherever I traveled. Lush have created a whole host of solid products from shampoo to toothpaste which make it so much easier when traveling, as you no longer have to worry about products leaking all over you bags, they are light and won’t get damaged and with the new airline regulation it makes taking products through airline security a lot more simple. All you need to use these solid mouthwash tabs is a sip of water. I personally take a sip of water first and then pop one of the mouthwash tabs into my mouth. I then give the tab a little nibble to help it dissolve. Your will feel a slight fizz as this mini little bath bomb for you mouth sets to work. As you swish the water the tab will complete dissolve. Once you have finished swishing spit out the water and you will be left with a clean and fresh mouth. It is advised that you don’t eat or drink for 30 minutes after use as all the ingredients that are working on keeping your mouth clean will just be washed away. 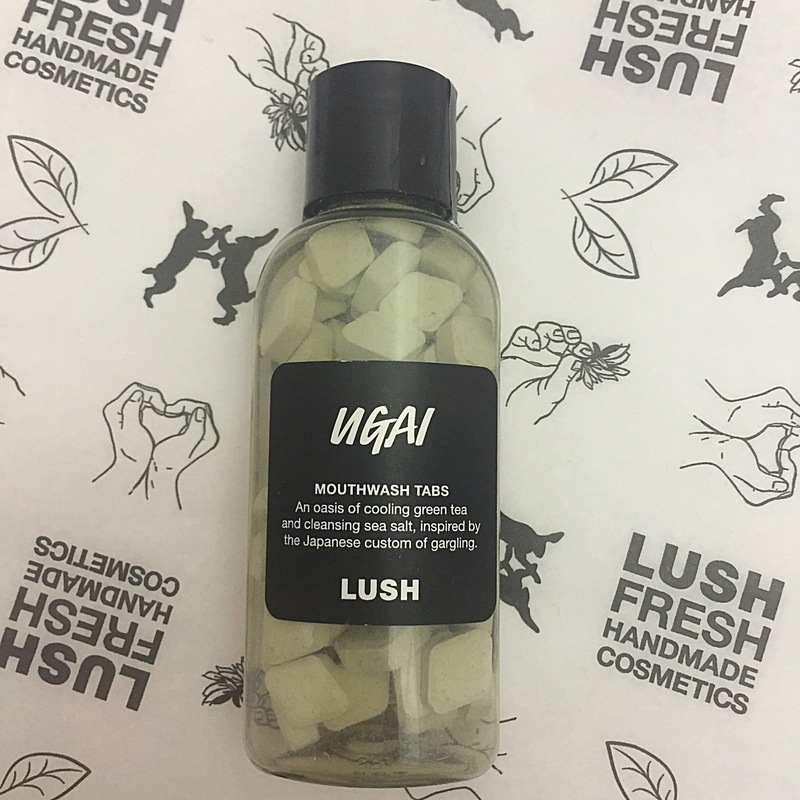 The solid mouthwash tabs are currently avaliable in three flavours Ugai, Creme De Menthe and Pan Galactic Gargle Blaster. Each flavour mouthwash is very different and it will depend a lot on you personal tastes which one you will like best but below are my views on these fabulous products. When I first received my parcel containing the new solid mouthwash tabs the one I reached for first was the Pan Galactic Gargle Blaster. Why did I pick this one first? Well mainly because of its incredible name. The name of this product was inspired by the Hitchhikers Guide to the Galaxy and I think it is perfect for this product. I wasn’t really sure what to exspect as this was my first experience of trying this new invention. As soon as I opened the little bottle I was very impressed with how strong the scent was and a little perplexed as to how I felt about the scent as it wasn’t that of which you would normally find in a mouthwash. 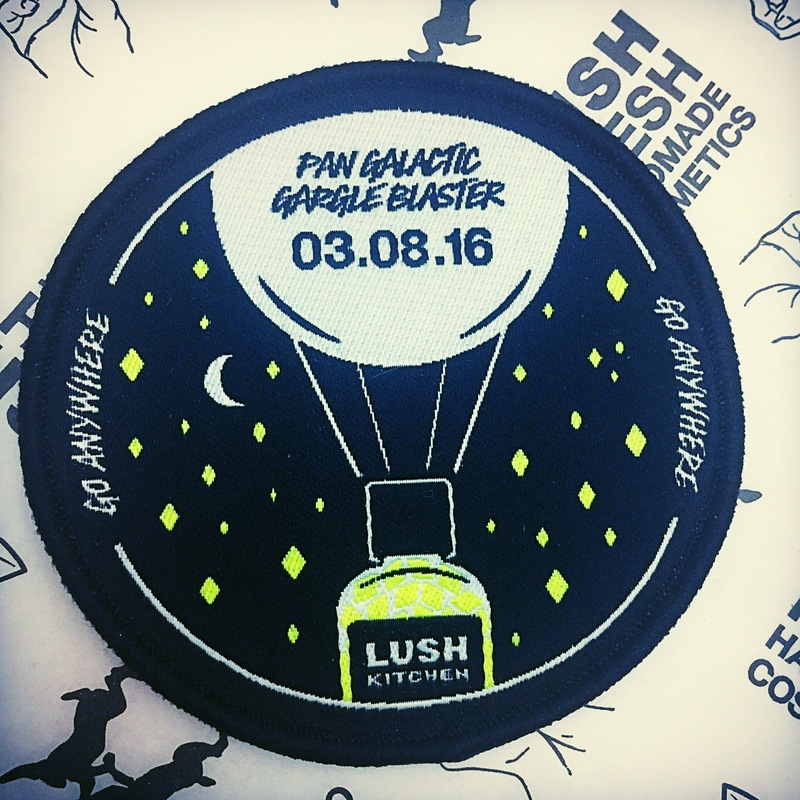 The Pan Galactic Gargle Blaster mouthwash tabs are a lemon yellow colour and contain menthol crystals, lemon oil and aniseed oil. I found the lemon to really stand out in this scent although I would say it has quite a medicine aroma similar to that of lemsip or cough sweets. After I had got over the initial strangeness of using a mouthwash in solid form I really enjoyed using this product. After using it I found my mouth felt extremely clean. I didn’t actually pick up on the aniseed until after I had used the product. If you don’t like how strong a lot of mouthwashes can be I would really recommend this one as it still has a slight kick but it isn’t as overpowering as a lot of mouthwashes can be. The second solid mouthwash that I decided to try was the Ugai . Lush describe this mouthwash as an oasis of cooling green tea and cleansing sea salt, inspired by the Japanese custom of gargling. When I first opened this bottle and took my first wiff of the scent I was a little unsure as to what I thought. It personally reminded me a lot of a foot treatment or face mask and I could instantly pick up on the tea tree, which is not normally something I would want to put in my mouth. However I put this though to one side and tried out the little grey coloured mouthwash tab. I found Ugai to be a very peculiar taste. I wouldn’t say I didn’t like it but as the same time I defiantly didn’t love it. As well as tea tree oil this mouthwash also contains green tea powder and sea salt. I think the main aspect of this product I was not keen on was the sea salt. I have a real issue on salt in mouth care product as I really don’t like the taste. After using this product I did feel like my mouth was very clean and it had a very light and fresh feel to it. Have you tried this one yet? How did you did you find the taste? The last of the three products that I tried was the Creme De Menthe mouthwash tab. Green in colour with a hint of shimmer I found my self instantly favouring this bottle out of the three. I do think it’s a slight psychological thing, but I find it very hard to use a mouth care product that isn’t mint flavoured. Containing menthol crystals, peppermint oil and peppermint powder this mouthwash tab is defiantly the colsest to a conventional mouthwash in terms of taste. As soon as you open the bottle of this mouthwash you are hit by its fresh peppermint scent, lush even describe this product as your double shot of peppermint freshness. During use I would defiantly say this is the strongest of the mouthwash tabs and have a very strong mint taste. After use my mouth was left feeling very clean and very fresh. I could still feel the effects of the cold menthol for quite some time after use and would say this mouthwash is the best for keeping your breath fresh. Overall I am very impressed with this new solid mouthwash invention from lush. As soon as I got over the strange feeling of using a solid mouthwash I really enjoyed using this products. I think they are great for use at home, for popping in your bag on a trip out or for taking with you on longer journeys. I have one bottle in my travel wash bag and one that I keep in my handbag as they are so quick and easy to use. I do feel the tastes and scents of these products are very different and will depend on what you like. Personally I love the Creme De Menthe best. 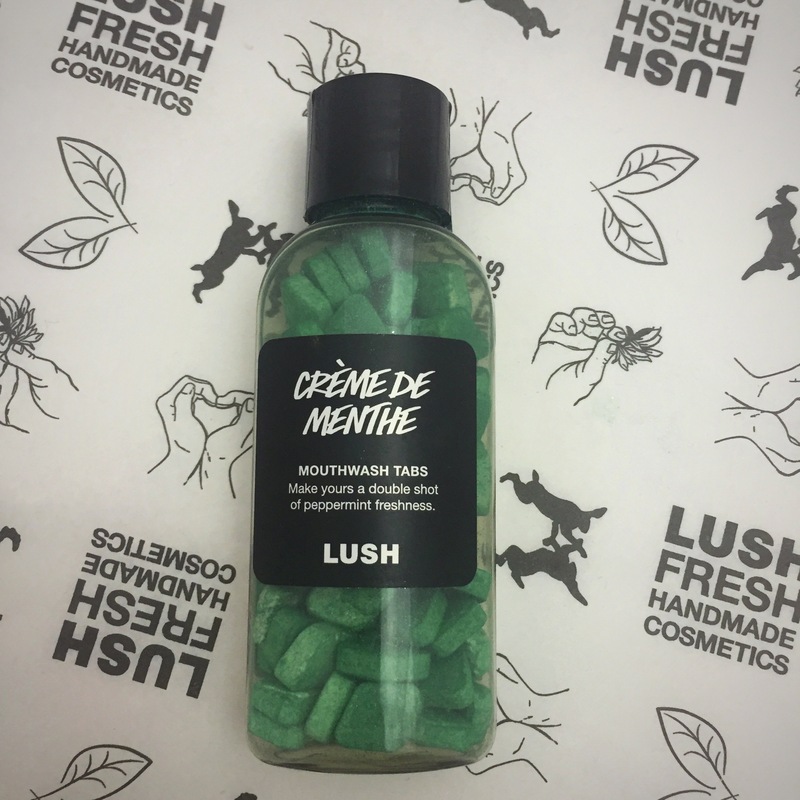 These solid mouthwash tabs are currently only available at the lush Oxford street store and on the lush kitchen for a limited time. I do however look forward to them hopefully making in appearance in every store soon. I saw these today and wondered what they were! Gutted I didn’t get any now would love to try!